Speaking to hundreds filling Lehman Auditorium at EMU, Christian activist and bestselling author Shane Claiborne challenged his listeners on the occasion of Martin Luther King Jr.'s birthday to take time to act when they see injustice or someone in need. Photo by Lindsey Kolb. Mullet, a 19-year-old sophomore from Berlin, Ohio, joined fellow students Monday afternoon helping to clean up Blacks Run in Harrisonburg. The volunteer project was one of more than a dozen events organized by EMU to honor the late civil rights leader on Martin Luther King Jr. Day. 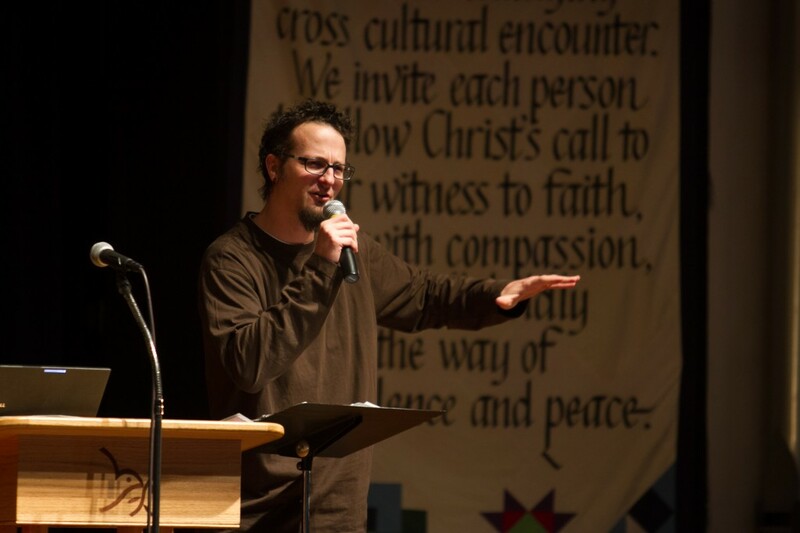 The centerpiece of the university’s festivities was a chapel service, led by Christian author and peace activist Shane Claiborne. During his speech in Lehman Auditorium, he acknowledged that much has been done to promote King’s message of equality and nonviolence worldwide. “It’s a beautiful thing to celebrate … but we have a long way to go,” said the 37-year-old Kensington, Pa., resident. Claiborne challenged those in attendance to take time to act when they see injustice or someone in need. Often, he said, people are too wrapped up in their busy schedules. Sometimes, Claiborne said, we have to ignore our schedules and answer the call to action. “Allow space for interruption,” he said. Before ending the service, he played a recording his friend made of Iraqi youths singing “We Shall Overcome” in Arabic. Throughout the day, the university hosted a variety of events, including the reading of King’s “letter from Birmingham Jail,” and service projects. While the campus has celebrated MLK Day in the past, Brian Burkholder, campus pastor, said this year the university expanded its efforts to help build relationships with the community. “Martin Luther King’s legacy connects deeply with the values, mission and vision of EMU … the call for justice … for peace building,” Burkholder said.